Do you have any Halloween candy laying around the house? We don't because somebody in this house is a junk food monster. I had to purchase the candy just two days before Halloween and leave a stash in my office as backup because somebody loves candy a bit too much. Ahem. Well, let's say you do have candy left. 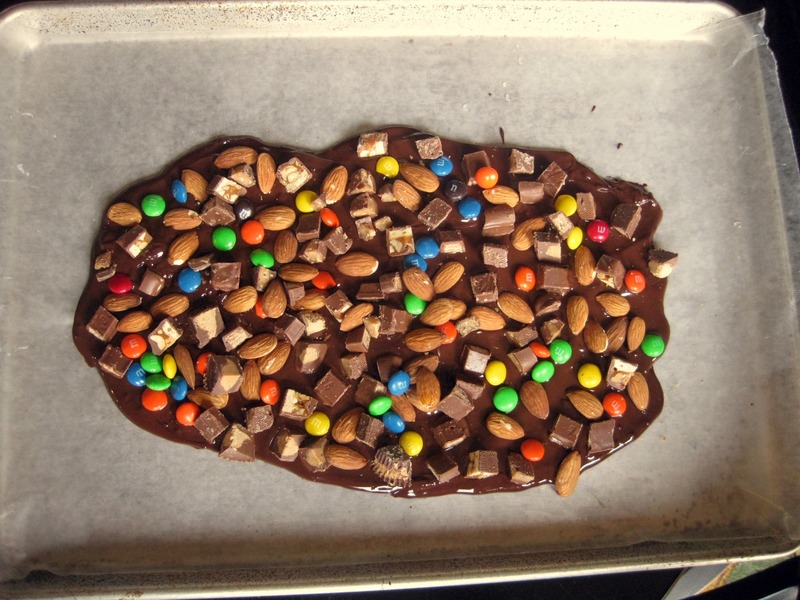 Halloween Bark is a great way to use up those little odds and ends! What's a "bark"? 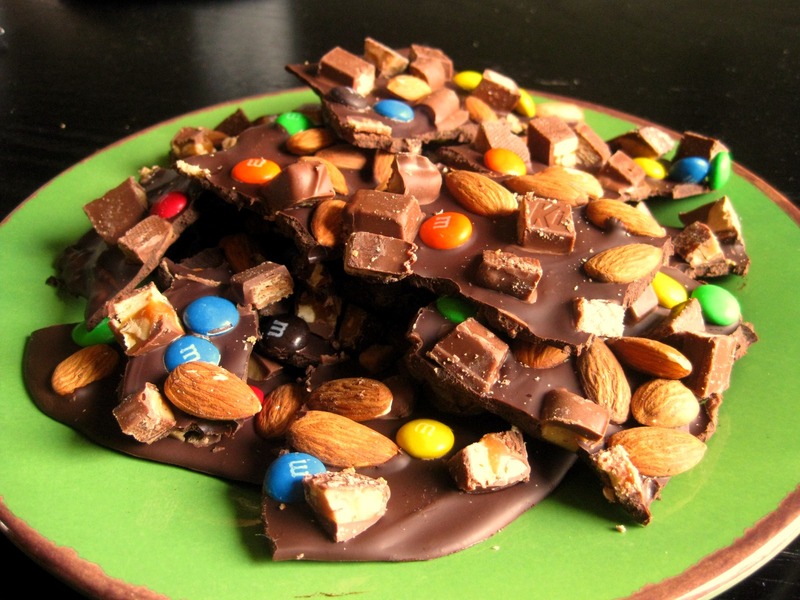 At Christmas there's peppermint bark (the variety at Williams-Sonoma is my mom's favorite), some people make almond bark... it's basically chocolate topped with nuts, more chocolate, or candy and then broken into pieces. It's easy to make and it looks festive. This was featured in the October 2010 issue of Bon Appetit. Of course, I misplaced my October issue (maybe it's in the car? ), but I kept seeing people making this all over the food blogisphere, so I had to try it, even if I am a bit late. 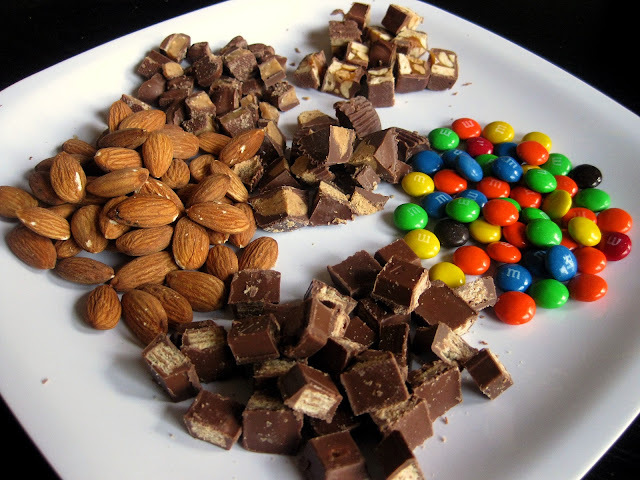 I chopped up about two cups of assorted candy and some nuts. Use whatever you like. If you use candy that you don't like, you won't like your Halloween Bark. Melt 8 ounces of Bakers Semisweet Chocolate in the microwave. Of course, you could use a much more expensive brand, but Bakers is easy to find and I had it in my pantry. I chose semisweet chocolate because there's more than enough sugar in the other ingredients. I felt that milk chocolate would be overkill. But if milk or white chocolate is your thing, go for it. Slide the entire pan into the fridge and let it chill for an hour. After it hardens, break it into random pieces and you have Halloween Bark! No baking and no drama. Pretty easy, right? This recipe makes about 10-12 decent sized pieces. Even the candy monster at my house hasn't eaten it all yet. It's pretty sweet. Chop up the semisweet chocolate and put it in a microwave-safe bowl. Cook it at 1 minute intervals (stirring after each minute) until chocolate is melted. Pour melted chocolate onto the wax paper. Top with chopped candy and nuts. Refrigerate for one hour. 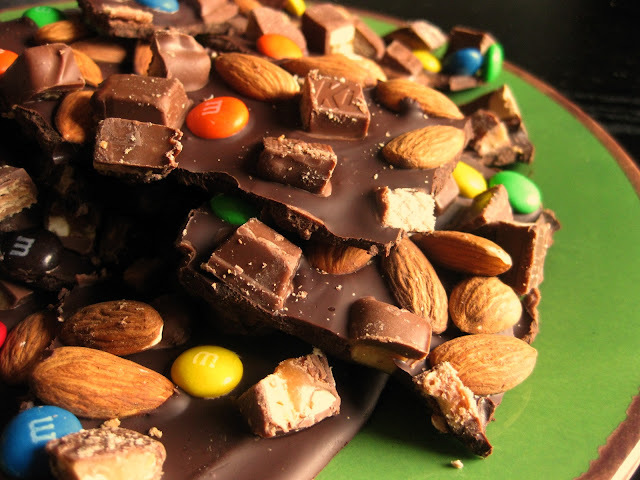 Break Halloween Bark into pieces. Store in the refrigerator. I'm sure not shocked to read that we don't have much chocolate candy. I didn't buy any so what we have is whatever Babygirl rcv'd. I'll have to go through her bag and grab them. I've seen these around the web too and wanted to make some to send in to Babygirl's teachers. My Favorite Cooking Day of the Year!